"University life is better than Charlotte ever imagined-- a sophisticated and generous roommate, the camaraderie of dorm living, parties, clubs, and boyfriends. Most of all, Charlotte is exposed to new ideas, and in 1981 Ghana, this may be the most exciting-- and most dangerous -- adventure of all..."
Aluta, a word used by many Africans to mean “struggle for freedom and liberation” comes from the Portugeuse phase, “A luta continua, Vitoria e certa”- the struggle continues, victory is certain. The word was commonly chanted during protests against colonial oppressors and later against harsh African regimes. 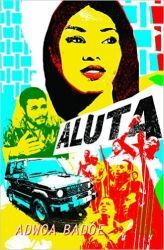 College students throughout Africa shouted Aluta! during peaceful demonstrations and movements of mass resistance. Our main character, Charlotte, is an 18 year old freshman, away at college and from home for the first time. University life in Ghana is riveting and she quickly meets all kinds of friends and acquaintances that educate her about real issues just as much, if not more, than her classes do. The story takes place in 1981, but aside from the fashion and music references, it is very similar to college life in Ghana today. No where in sight of her parents, especially her opinionated father, Charlotte tries everything. She goes out to the clubs, explores relationships with a rich business man and a student activist, and dabbles in student politics. Meanwhile, Ghana is going through major changes. The government is overthrown and everything freezes. Universities are shut down and students are forced to go home and join work camps to haul crops to the coast for export. When the universities open back up, she has a better sense of what is important to her and she decides to become a leader in student government and get more serious with her boyfriend. Danger is lurking, as the government and rouge militaristic men arrest, torture and seize seemingly innocent people all over the country. Someone decides Charlotte has seen too much, knows something she shouldn’t or has gained too much power. She is captured while attempting to attend a national student government meeting off campus. This story has a tough ending, but gives a glimpse into the lives of young women who are used and abused during national conflicts. who are silenced during their quests for justice and positive change. Author, Adwoa Badoe, represents Ghana well and gives us a story about young Africans that we haven’t heard. She fairly portrays female and male characters, never relying on stereotypical depictions of them. of the story is rushed and the prologue gives away a bit too much. The cover of the book is fantastic- colorful and representing Charlotte as the star of the novel.